Today I found 2010's Erasing David by David Bond and Melinda McDougall. This is a documentary about information. More to the point, this is a documentary about the amount of information being captured and stored every day about YOU. I'm sure that you are aware that every time you use your credit card or cell phone, that information is being logged into a database somewhere. Every time you purchase something on Amazon, or use I-Tunes, or click on a web site (like this one), that information is captured and held. Got a traffic ticket? Captured. Use a FastPass for a toll booth? Captured. Library? Captured. On-line Gaming? Captured. Streaming movies? Captured. Doctor's visit? Captured. Married? Captured. New Baby? Captured. Pet License? Captured. It's enough to make you wonder what has happened to your privacy. It's enough to make you kind of paranoid. Erasing David kind of revels in this. The basic gimmick of the documentary is that filmmaker David Bond wants to see if he can escape off the grid for 30 days. He hires a “crack team” of private detectives to find him as he tries to disappear. This part of the film is rather overblown, staged, and distracting, though, and I almost found myself fast forwarding through much of it. What is really interesting about this film, and what makes it worthy of note, is the back story Bond provides as the impetuous for his “experiment.” Bond had received a letter from the British Government informing him that due to the “misplacement” of Government data, some of his personal information had been compromised. The letter informed him that he had nothing to worry about, though. This letter makes him curious to find out exactly what data the Government kept on him, as well as how much information others have about him. It turns out that there is a lot of information being gathered unbeknownst to him. The scenes where Bond is going through all this information is unsettling. He ends up making these huge piles about what the Government and private companies know about him, his wife, and his child. Bond then goes further, interviewing people whose lives have been turned upside down because of misrepresented or stolen personal information being held in these corporate and government databanks. I recommend watching this documentary if for no other reason than to fuel your paranoia. The film ends with Bond having some serious concerns about the information the schools are gathering on his child, and the consequences of that sort of data being available. The film raises some interesting questions about our privacy in the digital age. It also raises questions about some of the potential issues this sort of data mining can cause. As the world gets smaller and smaller, and governments and corporations are seeming to exert more and more control on our lives, these are, unfortunately, important questions that should have more of a public platform for discussion. 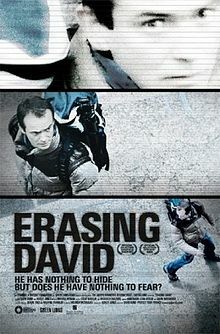 Films like Erasing David might just help build that platform.